Did you know your favorite club has a mall too? Season’s greetings everyone! We’re going to try something new here. Most of you who’ve visited us know we have some of the most talented DJ’s and performers in SL. But did you know we also have some of the biggest names in formal wear design too? Clothing, shoes, jewelry, everything needed for an elegant evening out, these wonderful vendors also have a shop right here! 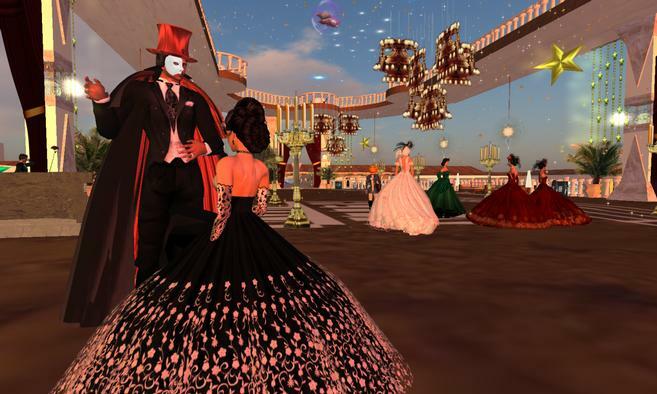 And while you explore around the sim, shop, or take pictures of you and your Sweetheart at the various romantic spots on the sim, you can hear some of the finest jazz and romantic favorites streaming 24/7 from the open air outdoor ballroom. Just a small sample of the designers to be found here are: Zhao Shoes, Agnes Finney, Styles of Edo, La Dulce Vida, SF Design, Rufeena, Glitterati (are you drooling yet? ), Clio, Alyssa Bijoux (!!! ), Chez Gabrielle, Bliss Couture, JCNY! All located on a lag free sim.